Comfortable lodge with two double one twin and one with bunks. Bath with overhead shower. Enjoying a beautiful woodland setting close to Loch Tay just outside Killin and boasting lovely views around Ben Lawers these well maintained terraced lodges are perfectly situated for exploring the many delights of Breadalbane Scotland’s popular heartland. Perfect for lovers of outdoor pursuits and photography this mountainous country bursts with activities. Killin 9 hole golf course is adjacent together with a choice of courses locally. Superb watersports magnificent salmon and trout fishing hill walks climbing and gentle nature trails with abundant flora and fauna abound. The famous Falls of Dochart and the Fortingall Yew the oldest living thing in Europe are close by. 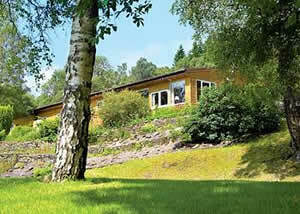 The West Coast Glencoe Glasgow and Edinburgh are easily accessible. Killin Pine 4 is in or near Killin in Perthshire, Central Scotland.